This new version of PostTrans has some significant changes in what was called “LIVE LOOKUPS”, which has now been renamed “In-Cell Searching”. Which is easier to setup, as it now has a User Interface for the settings. Hold down SHIFT and press [Setup] to access these settings. All examples use the new In-Cell Searching, which is a PRO feature of PostTrans. Existing installation should work without change. But to use the new “In-Cell Searching”, which is superior to the previous “LIVE LOOKUPS”, you would need to either start using the examples included or upgrade your existing templates. Backup: You can backup your existing version of PostTrans, by making a copy of all files beginning with “PostT*. *” in the Exchequer folder. And copying the “PostTrans” folder. 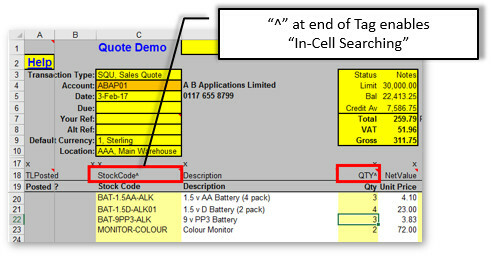 Add “^” to any tag in row 1, or in the case of a transaction row 28, which has In-Cell Searching enabled, such as GL, VAT Code, Location, Qty change, etc. It will also add comments which contain a description of the column mapping. 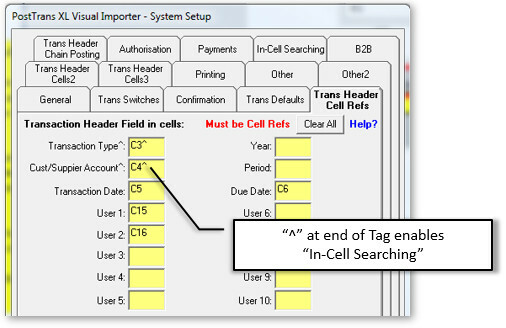 Header mappings will have “^” added to the reference to denote they have In-Cell Searching. 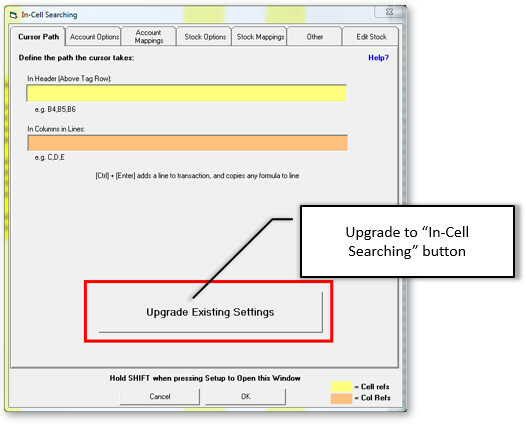 Removing the ^ will disable the In-Cell Searching within the cell. If the cursor path was defined by “Chain:” in cell B1. It is deleted and moved to new settings store. You will need to define the columns it works with though. If TransLookup is in cell A1, then it is removed. The new settings are stored in a comment in cell A1. Your sheet should now be upgraded. As this will no longer be needed. Indeed it may be best to delete the "PostTransLIVELookup.xla" file from the Exchequer directory since it's no longer needed. 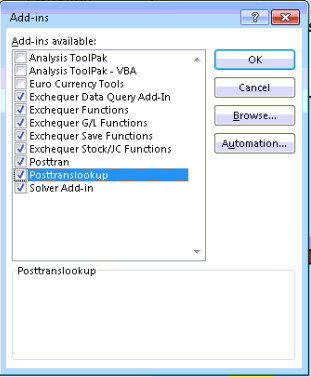 If you use the remote lookups then you will need to download and replace the PostTransLookup.xla on any PC's which use it.